Beijing was once a city of personal bicycles and domestic brands such as the heavy but reliable Flying Pigeon were all over the capital before cars and scooters began to proliferate as China quickly developed. Today, bicycle shops are selling fewer and fewer bikes as cycle sharing becomes the norm. “These share bikes have taken away our business”, says Chen Wei Dong, 43, a bicycle salesman in the Chinese capital. 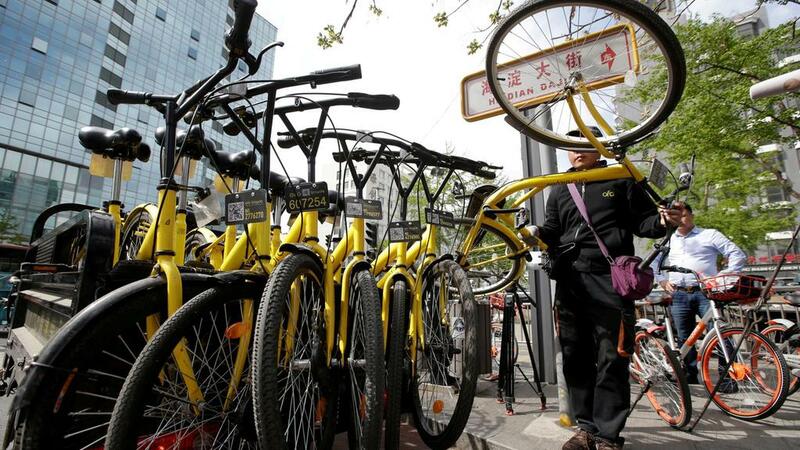 The hire cycles he refers to largely belong to two companies and the Chinese capital now swarms with the yellow bicycles of Ofo, and the metal and orange ones of Mobike. These two firms, the dominant players both founded in Beijing, are now becoming global leaders in a newfangled business that marries technology, transportation and cutting-edge big data applications. Public bicycle-hire schemes have appeared in cities before (think London’s “Boris Bikes”, a service initiated by then London mayor Boris Johnson in 2010), but the bicycles that Mobike and Ofo operate work differently in one crucial way: they don’t need to be docked and locked in specific places. In Beijing, and many cities around China and the world, Ofo and Mobike bicycles can be found wherever its most recent user leaves them. Users download a proprietary app on to their phones, register an account and deposit payment (from 199 yuan, about Dh115, to 299 yuan, depending on the company). Once registered, users simply walk up to any branded bicycle, scan the QR code displayed on the bike, or input a pin, and the bicycle automatically unlocks, leaving the user to ride it away. Typically, the companies will charge around 1 yuan per hour, using mobile payment systems, which are ubiquitous in China, but costs can vary according to the user, and with regular promotions. Ofo is the older of two, founded in 2014, and now operates over 10 million bikes in 250 cities across 21 countries. Ofo is valued at US$3 billion. Its major rival is Mobike, founded a year later, and which has around 100 million users and supports about 25 million rides a day, and is similarly valued to Ofo. In June 2017 Mobike raised $600 million from Chinese tech major Tencent. The American chip maker Qualcomm is also an investor. Ofo, meanwhile, raised $700m in a funding round in July led by Tencent rival Alibaba. Together the two bike-share companies have raised a combined $2.2bn of capital. But will they generate returns? When asked about yearly revenues Ofo declined to give figures but said it has been making profits in some cities already, insisting bike rental fees is and will remain its main source of income. Eden Ding, vide president at Panda Capital, a venture capital firm based in Shanghai, and his partners chose to invest in Mobike, over Ofo, in April 2016. “Ofo took an operational approach to their business,” he says. “Their strategy was to use conventional bikes [no GPS, no smart locks, no weather-resistant frames or solid tyres] and place them densely throughout the city”. Mr Ding says that Mobike, on the other hand, is a “product-focused company” using better materials and incorporating a smarter design, with smart locks (Ofo uses a pin system and manual locks instead of the QR code-enabled smart lock of Mobike), and a built-in generator that charges the GPS when it’s ridden. But why invest in Mobike in the first place? Mr Ding says based on his firm’s calculations, he predicts Mobike will turn a profit in less than three years, and that Mobike’s superior product helps to weather long-term costs of keeping their bikes in public use, and fulfilling a “huge demand for short-distance commute solutions in China”. Both companies in fact aim to solve what is known as the “last mile” problem, whereby people need to travel from their homes and offices to subway and bus stations. Bicycles offer a cheap and environmentally friendly solution for such short-distance commutes. Analysts believe that significant income generation will not come from collecting rental fees but from other avenues. One is brand cooperation; offering coupons for a store that is on a rider’s route (Mobike already works with McDonald’s, for instance). Advertising, on wheels, could be another revenue source. Money lending is another – the two companies hold hundreds of millions of yuan in user deposits. Data is also a potentially valuable resource as the bikes track how they are being used. Mobike shares its data with city planners and public transport agencies, and has its own AI platform, Magic Cube, to interpret the data each of its bikes collect as they track their use. There are over 8 million Mobikes in service, in 200 cities in 13 countries worldwide, all connected to the firm’s cloud in the world’s largest mobile IoT network, it says. “The AI platform enables us to integrate and analyse hundreds of variables including weather, time of day, location, crowd patterns, and supply and demand trends, resulting in highly accurate predictive models that can be used to enhance operating efficiency,” Mobike says. Such data can be used to help cities optimise existing public transportation systems as well as plan new infrastructure, such as bike lanes, Mobike says. Joe Xia, the co-founder of Mobike, who previously worked as a software engineer, has said that bicycles are just a part of a bigger vision he is exploring. Electric bikes and car-sharing are on the cards. Mobike has a car-sharing unit and China’s FAW car company has a 10 per cent stake in the new venture, and will provide electric cars for a pilot project, he says. Mr Ding, meanwhile, believes Mobike has a lot of potential across the entire transportation ecosystem. But Mobike will not have it all its own way. Ofo has Didi Chuxing, China’s enormous Uber-beating car-hailing service, as an investor and the two companies are exploring how to integrate their respective services. As with Didi Chuxing, which was born of a merger between the two rival ride-hailing services Didi Dache and Kuaidi Dache, many believe that in the long run Mobike and Ofo may merge. For now both companies are expanding aggressively, and believe rental fees alone are enough to make them profitable businesses if they stopped spending on expansion. Zhang Yanqi, Ofo’s operations boss, has said that China alone could support 300 million rides a day, up from its current 50 to 60 million per day. But there is a downside; as more and more bikes hit the streets, they add to the urban chaos, with riders leaving them more or less anywhere. Rush-hour users in Beijing park them in public-bus lanes, leaving them for street attendants to pick up and move aside. Rows of bikes, some of them toppled over, crowd the sidewalks, leaving pedestrians little space to walk. And spare a thought for the traditional bicycle sellers – The National found bicycle shops across Beijing reporting major sales declines. It seems bike sharing is the future for China’s cycling masses.